Where bathroom space is at a premium, this corner timber bathroom vanity is space efficient and well thought. Yet, this bathroom corner vanity is large enough for many of your bathroom essentials and accessories. Less clutter will make your bathroom appear more spacious. The warm red cedar colour, and the triangular arrangement adds to the bathroom's décor quotient. This bathroom vanity transforms a bathroom corner from a forgotten space and reinforces it as a focal point where multiple wall textures and patterns meet the warm red cedar. An interesting feature of the Colonial Corner Timber Bathroom Vanity is the crescent shaped upper shelf. This allows you to easily utilise those once unreachable areas. By the nature of their design, deep corner bathroom vanity units introduce inaccessible space located generally at the back of the bottom shelf. The top is a 25mm solid red cedar with a timber-lipped edge to prevent water from sopping on the sides of the vanity. The solid red cedar top also yields a generous revealing of cedar's elaborate grain. Now it's time put it in its place. 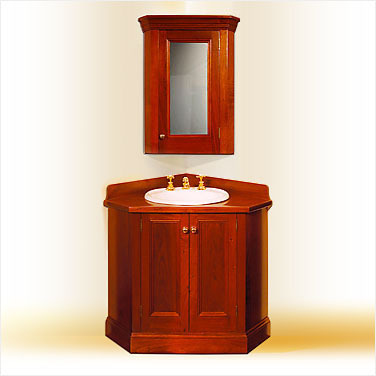 Go ahead and inspect the fine details of this timber bathroom vanity. It's as close as to being in our showroom and sliding your hands over the smooth red cedar finish. Click below to explore this bathroom vanity closer. This Colonial Corner Timber Bathroom Vanity with Matching Shaving Cabinet is also available with other customised options to suit your various bathroom style requirements. Colonial Living reserves the right to change bathroom vanities specifications without giving prior notice.